Janson Beauty is always striving to bring you the newest and finest for the Afro-Caribbean cosmetics and beauty wholesale industry. For both salon owners, barbers and individual customers we have a wide range of options for all hair types at fantastic prices. Since our successful release of the Aliza Hair Dryer 2000 and 4000 Ionics, we now have announcement – the exclusive release of our Aliza Hair Straighteners! As with our Aliza Hair Dryers, we have two great versions of the Aliza Hair Straighteners – The Aliza Titanium Professional Hair Straightener, which is a more heavy duty model designed for professional use and coarser hair types, and the Aliza Ceramic Hair Straightener, which is ultra lightweight and has been designed for personal use on normal hair. Both these products are state of the art and are perfect for hair styling without the heat damage, whatever your hair type! The Aliza hair straighteners have been specifically designed to both protect and nourish hair while straightening, so your hair isn’t exposed to any heat damage. The Aliza Ceramic has up to 30 different heat settings from 80°C to 230°C, with an easy to use key so you can use precisely the right temperature for your hair type, whether it be a low heat for fine, thin hair or a high heat for thick hair. 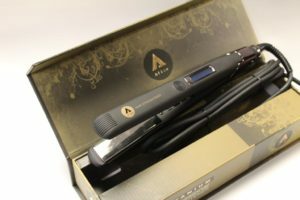 The Aliza Ceramic Hair Straightener is a diverse and customisable product which also has 1 inch true grip ceramic plates, specially designed to eliminate gaps for a smooth and easy glide. In comparison, the Aliza Titanium Professional has Titanium plates, to retain heat for thicker or coarser hair styling at 15 different temperatures. Both products have a tangle-free swivel cord which is perfect for easy styling wherever you are, and the Aliza Titanium Professional cord stretches to 2.6 meters in length – perfect for professional salon styling. They also have a soft touch control handle, and to keep you safe it has an auto-shut off after 60 minutes so there’s no risk of leaving it on and causing an accident. 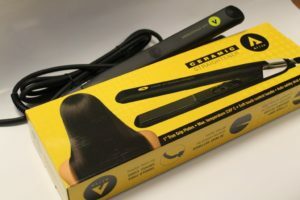 The LCD display is clear and easy to use, making hair styling simple. With Aliza’s high-quality, cutting edge ceramic technology, these Aliza hair straighteners are quick and easy to use for a smooth and sleek finish every time. The ceramic technology also means your hair will be more protected from the heat, so your hair stays hydrated and gorgeous – even if you’re using the Aliza hair straightener every day. For coarser hair the Aliza Titanium retains more heat to give longer lasting results with the same sleek shine. We’re confident that you’ll be satisfied with the Aliza Hair Straighteners, no matter what your hair type – we even include a 12 month warranty for if anything goes wrong with your purchase. Lightweight, sleek and easy to use, the latest member of the Aliza beauty family guarantees fantastically shiny and healthy styling for your hair. Both of these Aliza Hair Straighteners are available now, exclusively from Janson Beauty and Wholesale! Take a look at our website to see our fantastic rates and browse our many other state of the art products.